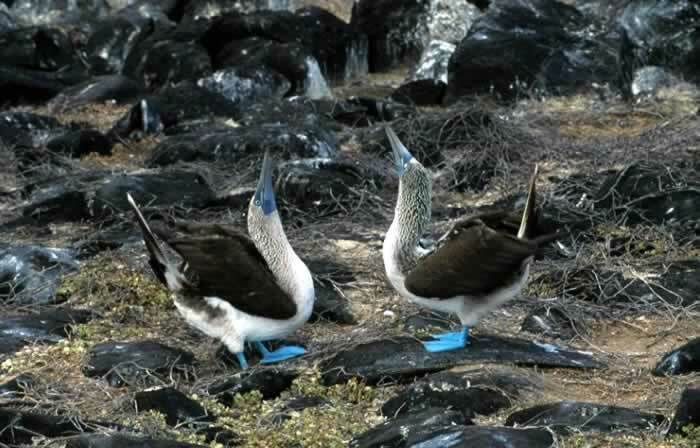 Among the animals my boy Darwin spotted on the Galapagos Islands were the blue-footed boobies (Sula nebouxii excisa). The name “booby” comes from the Spanish term bobo, which means "stupid fellow". 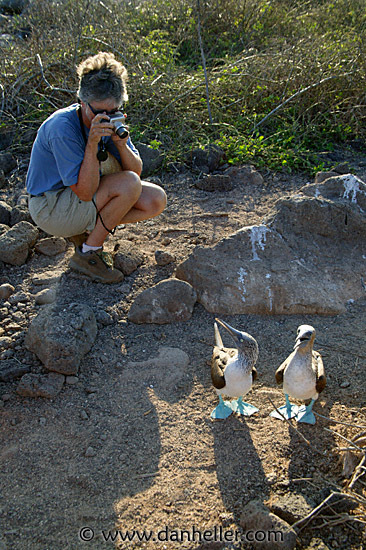 This is because the Blue-footed Booby is clumsy on land, and like other seabirds can be very tame and trusting. It has been known to land on boats, where it was once captured and eaten. 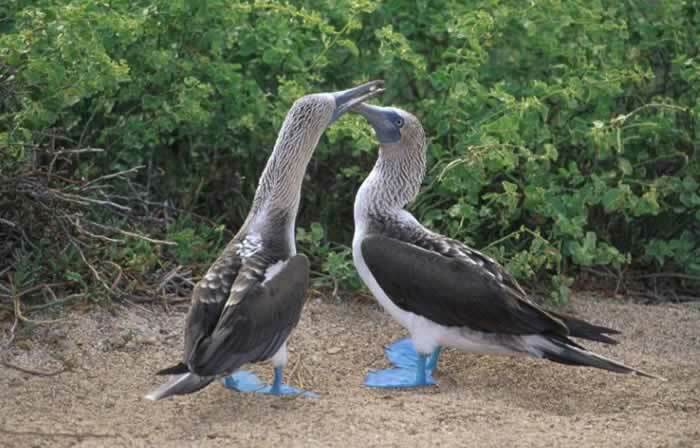 The blue-footed booby breeds from the Gulf of California south to Peru. They live on the open sea except when they're breeding. It breeds on ocean islands - its more romantic there I suppose. 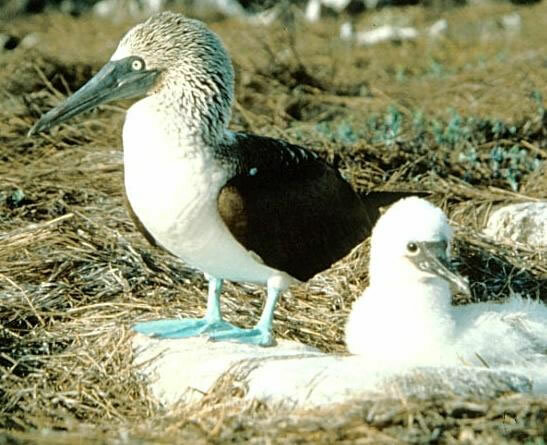 The femme blue-footed booby lays two to three pale blue or green eggs. The nest is on the ground. The eggs take about 45 days to hatch. Both parents incubate the eggs using their feet like penguins. As the eggs start to hatch, the parents will rest the eggs on top of their feet. The male brings food back to the nest for the female and the chicks. The chicks take regurgitated fish from their parents' bills. The chicks stay with their parents for about two months. They have a very elaborate mating ritual. The male raises one blue foot in the air, then the other, as he struts in front of the female like a Sumo wrestler before a match. Both the male and the female stretch their necks and point their bills to the sky. The male spreads his wings and whistles. The female may tuck her head under her wing. The blue-footed booby has a long neck, a sharp bill and bright blue feet. Its feather are brown on the wings, and its head and neck are brown with black streaks. Its chest and undersides are white. The blue-footed booby is a little under three feet long and its wingspan is about five feet. They plunge head first into the ocean, with their wings partly folded, to catch fish. The Blue-footed Booby's diet consists entirely of fish. They even catch flying fish when they are still in the air like a hawk or an eagle. Surprisingly, individuals do not eat with the hunting group, preferring to eat on their own, usually in the early morning or late afternoon. 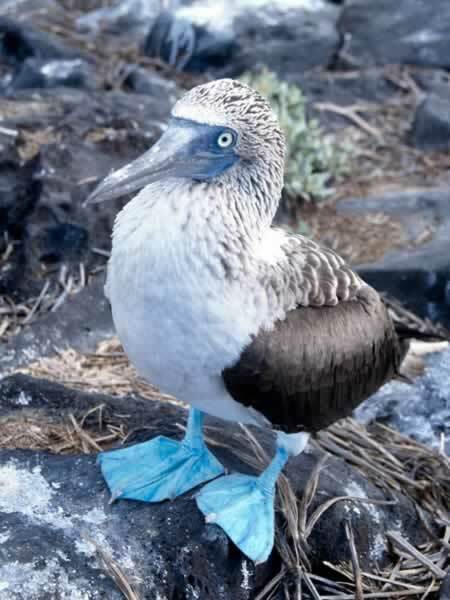 The booby is frequently referenced in Vonnegut's novel Galapagos.